Over on the Switchboard blog written by Kaid Benfield, he writes today about a free downtown circulator that Baltimore has recently put in place. (pasted below) This is a great heads-up to those cities that are cutting back on transit in tough times. I’ve thought for a while that we need an entirely new service model for transit in most American cities, and will write about this more in future posts. The reality is the current system in most cities is so completely unsupported by fares that we might as well have completely free zones in order to encourage denser, walkable development. And then, we need to find a new revenue/service model that works for other day to day service. What Baltimore is doing is very encouraging – let’s hope more cities follow their lead and really begin to see transit as a tool for economic development. 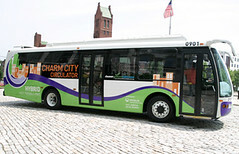 Last week Baltimore launched the Charm City Circulator, a free bus route that connects the city’s downtown with neighborhoods east and west and with other transit routes. At a time when many transit providers are having to cut back on service, Baltimore is betting that the new service will entice economic activity. Even better, the Circulator has a dedicated lane through congested areas and, by putting seven buses on the Orange Route (route above), the first of three planned, free Circulator routes, the city will be able to offer service at 10-minute headways. Neighborhoods served by the Orange Route, in addition to downtown, include the city’s popular Inner Harbor, Little Italy, and the University of Maryland’s Baltimore campus. The fleet consists of environmentally friendly diesel-electric hybrids. “We service residents, downtown employees, students and tourists and anyone else who wishes to ride. The shuttle is intended to reduce congestion and greenhouse gas pollution by offering a convenient, reliable and eco-friendly form of public transportation. The Orange Route serves an east-west corridor, as can be seen above. When introduced, the Purple Route will serve a north-south corridor will run all the way from Penn Station in the north to Federal Hill in the south. The U-shaped Green Route will run from City Hall down through Fells Point and then up to the Johns Hopkins University’s East Baltimore campus (see photo set). The routes intersect each other at several points and also connect to other forms of transit, including trains, light rail, buses and water taxis. Portland has long had a free downtown zone for its regular light rail service, but has had to cut back recently to address budget shortfalls. Several cities in Europe have free transit zones. Washington has popular circulator bus routes that link downtown with nearby neighborhoods and that link to but are operated separately from the main Metro transit system; the DC Circulator is not free, however, but operates on a reduced fare system. Baltimore’s bold venture into free transit service is an exciting initiative well worth following.